Walt Disney World Resort hotels may soon add basic first aid services to the list of guest amenities. Beginning next week, Disney's All Star Music Resort will start a 3 month pilot program with a registered nurse offering first aid. Similar to the in-park first aid centers, the resort registered nurse will be able to offer over-the-counter medications, bandages and other basic first aid. At All Star Music, the registered nurse station will be in the lobby of the hotel from 7:00 AM to 11:00 PM daily. A new temporary road and auto-plaza is now open at the secondary entrance to Disney's Hollywood Studios. When arriving from Buena Vista Drive (opposite Disney's BoardWalk Resort), Walt Disney World busses use the far right lane, with guests using the left lane of the new road. The work is being done as part of a wide range of improvements to the roadways and parking lots at Disney's Hollywood Studios, part of the park's redevelopment that will include Toy Story Land and Star Wars Galaxy's Edge. A new four-day, three-night Disneyland and Southern California Short Escape by Adventures by Disney takes you inside Walt Disney Imagineering for a rare VIP tour. This new guided group vacation gives you a behind-the-scenes look at places where Disney magic is made, including rare private tours of The Walt Disney Studios and Walt Disney Imagineering, VIP experiences at Disneyland Resort, an exclusive visit to Walt Disney’s Disneyland apartment, a sneak peek at props and costumes from beloved Disney films at the Disney Archives, and more. This new trip is available on select dates in Spring and Fall 2018, and pricing is around $3500 per person varying by date. Learn more at the Adventures by Disney site. Disney's Minnie Van Service is now offering transportation from select Walt Disney World Resort hotels to Orlando International Airport. Airport Minnie Van Service can carry 6 passengers and up to 3 car seats for guests under the age of 6. The service is available for airline flight departures from 9am to midnight, and Disney recommends to use the Resort Airline Check-In Service alongside Minnie Van Service. To get started, guests are being asked to visit the Resort Club Level Concierge with flight details. 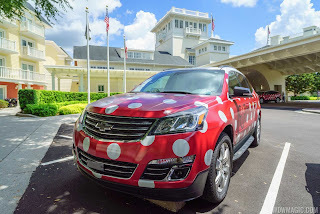 Like the initial roll-out of Minnie Vans Service, the airport service is limited to a small group of guests staying at certain resorts, including Disney's BoardWalk Resort. Disney's All Star Movies Resort will begin an extensive room refurbishment program beginning February 2018. The new rooms look strikingly similar to the refurbished rooms at Pop Century, and feature two queen beds, with one being a Murphy bed doubling as a table while in the upright position. Photo of refurbished rooms at Pop Century courtesy of WDWMagic.com. Each room will have large flat screen wall mounted TVs, and USB ports throughout. The bathroom receives a nice upgrade, with a sliding door between the bed area and the vanity, a mirror with integrated LED lighting, and a sliding glass door for the shower. There is also plenty of shelving in the vanity area, as well as an electronic safe. The mini fridges, while smaller, are more modern, with a glass door so the contents can easily be seen. There is also a coffee maker that will be standard in the room. Flooring is vinyl wood plank, with a solid black old style movie camera icon (like the one that appears in the All Star Movies icon) appearing near the doorway on the floor faded into it. Above the bed, there is pop art of Mickey, Donald and Goofy in their new styles (from the new Mickey Mouse cartoons on Disney Channel). Following the completion of the All Star Movies update in November 2018, All Star Music will be next, followed by All Star Sports. The look should be the same, but with each resort's logo embedded into the flooring.